China High-Speed Rail Tracks In Trouble? Construction of the mainland’s massive high-speed rail network is in danger of becoming a victim of its own success. The breakneck speed at which track is being laid means engineers are likely to have to sacrifice quality for quantity on the lines’ foundations which could ultimately halve their lifespan. The problem lies in the use of high-quality fly ash, a fine powder chemically identical to volcanic ash, collected from the chimneys of coal-fired power plants. When mixed with cement and gravel, it can give the tracks’ concrete base a lifespan of 100 years. But more than 1,500 kilometres of track have been laid annually for the past five years. This year 4,500 kilometres of track will be laid with the completion of the world’s longest high-speed railway line, between Beijing and Shanghai. Fly ash required for that 1,318-kilometre line would be more than that produced by all the coal-fired power plants in the world. Professor Wang Lan , lead scientist at the Cement and New Building Materials Research Institute under the China Building Materials Academy, said that given poor quality control on the mainland, the use of low-quality fly ash, and other low-grade construction materials, was “almost inevitable” in high-speed railway construction. And that could have fatal consequences, Wang said. With a catalytic function almost opposite to that of good fly ash, the bad fly ash could significantly weaken railway line foundations and shorten a railway’s lifespan by about half. That would mean China’s high-speed rail tracks would last only 50 years. But Zhu Ming – a researcher at Southwest Jiaotoing University’s School of Civil Engineering who experimented with fly ash at a Beijing-Shanghai high-speed railway construction site last year – was even more pessimistic. The use of low-quality fly ash would threaten the safety of rail passengers and “judgment day” might come sooner than expected, Zhu said. “Quality problems with Chinese high-speed railways will arise in five years,” he said. “I’m not talking about small problems, but big problems. Small problems such as occasional cracks and slips that delay trains for hours have already occurred. Big problems that will postpone an entire line for days, if not weeks, will come soon. The 2008 study conducted by Yin Yaxiong , senior engineer at the First Survey and Design Institute of China Railways, concluded that though China produced more than 100 million tonnes of fly ash a year, only a small fraction of it would meet the quality requirements for high-speed rail construction. In high-quality fly ash, the presence of unburnt carbon is extremely low. Coal-fired power plants with large, advanced furnaces are the main producers, but on the mainland, especially in less developed provinces, there are few such power plants. Most fly ash on the market comes from small or medium-sized plants whose furnaces cannot achieve full combustion, therefore producing low-grade fly ash with higher levels of carbon. The unburnt carbon in fly ash seizes water molecules. Cement needs lots of water for the chemical reaction that makes it set and harden. Wang said that the bad fly ash competed with cement for water and messed up the reaction. “Without an adequate … reaction, high-speed rail is lying not on a concrete foundation, but sand,” he said. Reports about the widespread use of low-quality fly ash in high-speed railway construction began surfacing in mainland newspapers in 2007. Undercover journalists followed fly ash convoys from power plants to railway construction sites in various provinces. Their reports generated a public outcry, prompting the Ministry of Railways to team up with the Communist Party’s Propaganda Department in ordering newspapers to kill all reports about low-quality fly ash related to high-speed railways. Some journalists received threats. Some lost their jobs. Since the 1950s, Chinese civil engineers have tried to use fly ash in building construction, and the dangers of low-quality fly ash are widely known. In a bid to ensure that only high-quality fly ash is used, the Ministry of Railways has set up testing laboratories at major construction sites. But fly ash suppliers sidestep the testing process, according to a Beijing-based journalist who spent three months investigating them during construction of the Guiyang to Guangzhou high-speed railway line last year. He requested anonymity. Arriving at a railway construction site on the Guizhou-Guangxi border with a convoy of trucks carrying low-quality fly ash produced by a small coal-fired plant, the journalist said he saw the trucks drive directly to a cement mixing facility and unload straight into it. “No sampling, no testing and no questions asked,” the journalist said. When that was completed, the convoy leader entered a building nearby with a bag of fly ash that he had in his pocket. In the temporary building was a small laboratory and in the bag was high-quality fly ash. The man handed the laboratory clerk the bag for sampling – with an envelope containing a bribe – usually 10 to 20 per cent of the fly ash price, the journalist said. Zhang Shuguan , deputy chief engineer for the Ministry of Railways, told Xinhua last month that the speeds on high-speed railways would reach 500km/h by 2050. 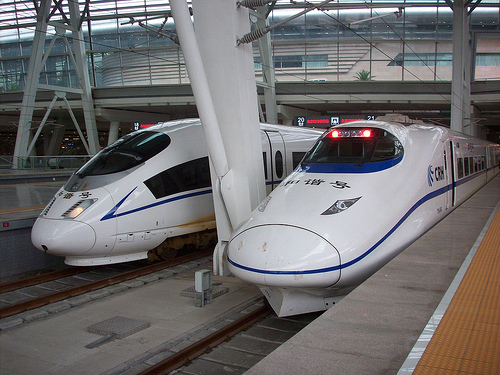 But Zhu said the average speed of trains on Chinese high-speed railways would probably decrease. The system must endure the daily, if not hourly, grinding and twisting of heavily built passenger trains travelling at 350km/h, Zhu said. Such operations would significantly speed up ageing of the railways. Some people had already urged that operations be slowed down to save the lines. “We will need luck to maintain 250km/h for long.” he said. Let’s hope the warnings by the engineers and materials scientists quoted in the article are taken into account by the authorities in charge of building the new rail lines. While corruption is still rampant in many areas of business dealings in China, the high-profile nature of the country’s high-speed rail network means that shortcomings in construction quality are unacceptable.